In our August 1999 Neuromuscular Case of the Month (now archived), a new laryngeal paralysis/polyneuropathy (LP/PN) syndrome was described in Leonberger dogs. The first dog identified with this polyneuropathy was Harvey (see images below). 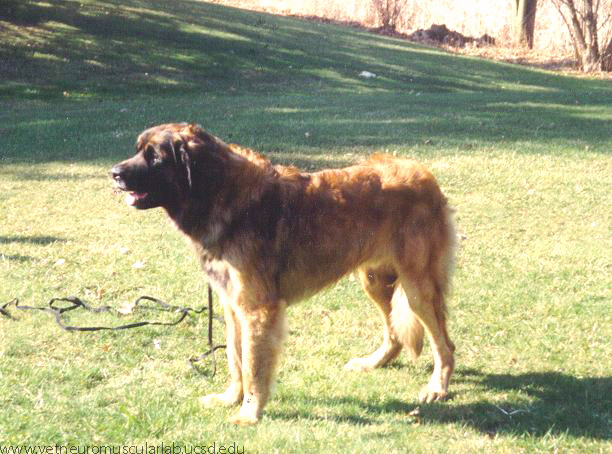 Since then, this LP/PN syndrome has been identified in Leonberger dogs from many countries including the USA, Canada, the United Kingdom, Sweden, France, Germany and Italy. 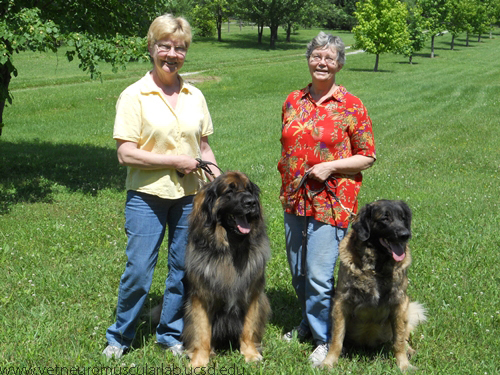 Thanks to the tireless dedication of breeders such as Ann Rodgers and Judy Johnston (see image below), the many veterinarians and Leonberger owners who have sent tissue samples to our laboratory to confirm a diagnosis of polyneuropathy, and the genetics teams at the University of Minnesota and University of Bern, a genetic test is now available (LPN1, see announcement below) to identify affected dogs and carriers for the early onset and severe form of polyneuropathy. Ann Rogers (yellow shirt) with Calvin and Judy Johnston with Brigitte. Due in large part to the efforts of these dedicated breeders and the memory of Harvey, a genetic test is now available for an early onset, severe form of polyneuropathy in young Leonberger dogs. Leonbergers may suffer from a hereditary neurological disease, which has frequently been termed â€œinherited polyneuropathy (IPN)â€� or â€œLeonberger polyneuropathy (LPN)â€� by veterinarians and breeders. Affected dogs suffer from slowly worsening exercise intolerance and may develop gait abnormalities, such as an exaggerated hitched step, especially in the hind limbs. There is often wasting of the hind limb muscles as well. Additionally, these dogs may have noisy breathing, a change in their bark, or even difficulty breathing due to involvement of the larynx and laryngeal folds in the throat. Eventually the disease may progress to the point where the dog can no longer support its own weight. Genetic research carried out at the University of Minnesota, the University of Bern, and the University of California San Diego, indicates that polyneuropathy is likely a group of several genetically distinct, but clinically similar diseases. We have mapped two major genetic risk loci and identified the causative mutation in one of these loci that we now term LPN1. Dogs being homozygous mutant (two copies of the mutation) for this mutation will typically develop neuropathy before they reach 3 years of age. At this time we do not know whether dogs heterozygous for this mutation (one copy of the mutation) might also develop mild clinical signs late in life, but they will most likely not develop severe disease. 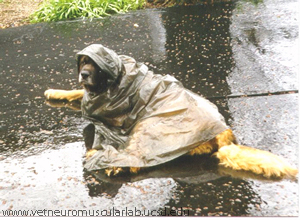 The identified mutation is responsible for approximately one third of the cases of polyneuropathy in Leonbergers. The other two thirds of cases are apparently caused by different genetic mutations. The University of Minnesota and the University of Bern will offer genetic testing for the identified LPN1 mutation starting July 1st, 2010. At this time we recommend that all breeding dogs should be tested. We also recommend avoiding breeding homozygous mutant dogs as well as matings that could produce homozygous mutant dogs. We do not recommend excluding heterozygous mutant dogs from breeding as this would significantly constrict the gene pool of the Leonberger population and might lead to an increase in the other forms of disease. However, dogs heterozygous for the LPN1 mutation should only be mated to tested dogs which are free of the mutation. This will ensure that no homozygous mutant offspring affected with the severe form of the disease will be born. At this time the implementation of genetic testing cannot completely eliminate polyneuropathy from the Leonberger population. This LPN1 test diagnoses only one of possibly several genetic risk factors. Thus, it is still possible that affected offspring with a different genetic form of polyneuropathy will result even from a mating of two dogs that both have been tested free for this mutation. However, the current LPN1 test can reliably eliminate one severe early-onset form of disease and significantly reduce the overall frequency of neurological disease in Leonbergers. Dog owners who submitted blood samples for the research projects in either Minnesota or Bern before 15-June-2010 will receive the results of this LPN1 genetic test at no cost within the next weeks. We are continuing to search for the other genetic risk factors and blood samples from additional dogs affected by apparent neurological disease will enhance this research. Dog owners who submit a blood sample from an affected dog, together with neurological exam or biopsy results, may recieve the LPN1 test for free. North America: Genetic testing will be performed at the University of Minnesota Veterinary Diagnostic Laboratory. The preferred sample is 2-3 ml of fresh blood collected in EDTA tubes. The price per test is $85 and the expected turnaround time is 3 - 4 weeks. The direct genetic test costs 110.-- CHF or 75.-- EUR plus VAT. Initially, we will run the test once a month. As we cannot run the complete procedure for single individual samples it may take 1-2 months until the result is communicated to the owners.